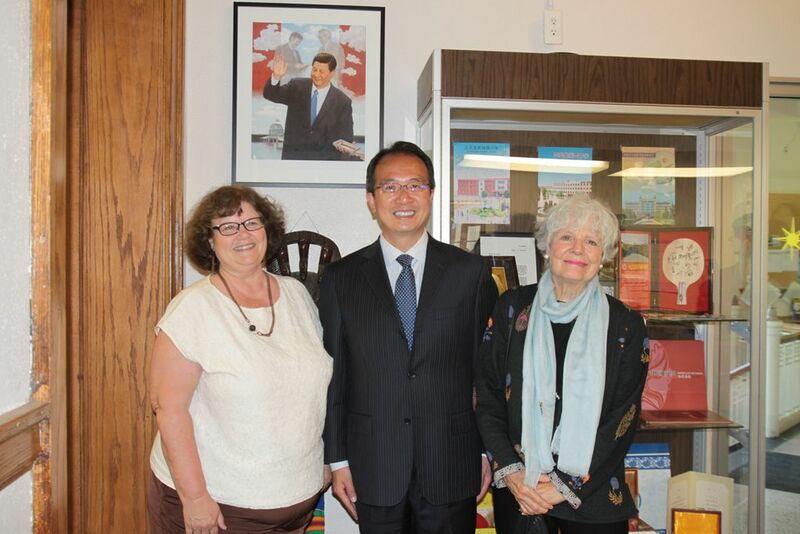 On September 20, Consul General Hong Lei paid a visit to the City of Muscatine, Iowa and met with Mayor Diana Broderson at City Hall. Consul General Hong Lei said he is delighted to have the opportunity to visit the City of Muscatine. As a symbol of China-US friendship, Muscatine is well known in China. In the context of the development of China-US relations, the sister-city relationship between China's Zhengding County, Hebei Province and Muscatine has become increasingly active. Many Muscatine companies are expanding their business in China. Chinese investment in Muscatine is also growing. Not long ago, Muscatine High School Choir was invited to visit China and participate in the China International Chorus Festival, which has become a new highlight in our cultural exchanges. The Consulate General would like to make joint efforts with the city government to continue to develop friendly relations between Muscatine and China. Mayor Broderson welcomed the Consul General’s visit and said that Muscatine attaches great importance to its friendship with China and would like to actively deepen cooperation with China in the fields such as economy, trade, culture and education.